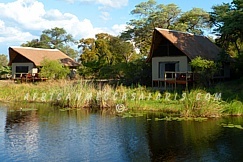 Lagoon Camp is perched on the banks of the wild Kwando River. 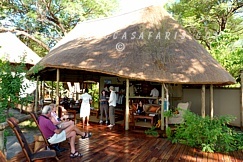 The camp is nestled beneath towering ebony and marula trees and accommodates up to 16 guests in eight traditionally styled ‘tents.’ The heavily forested site is home to a wide variety of birds and mammals, while elephant and hippo are normally visible from the camp. The stunning views and close proximity of wildlife all contribute to the pervading sense of calm at Lagoon. 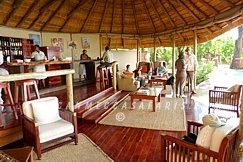 The main area at Lagoon has a lounge with a bar offering a vistas of the beautiful Kwando River. There is a also separate dining area. 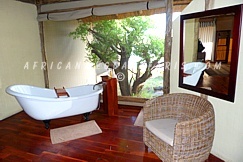 Guests can also enjoy the pool to relax between game drives during siesta time and share safari stories or listen to the sounds of the night by the sandy camp fire site. 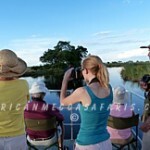 Seasonally large herds of elephant drink at the river bank near to the camp in full view of the main deck while playful spotted – necked otters are commonly seen performing in the water. 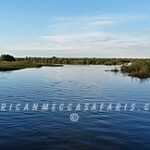 At Lagoon the defined river channels give way to flood plains, both permanent and seasonal and the ox bow lakes make many secret lagoons favored by game for drinking in the dry season. 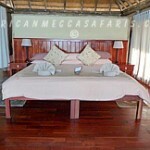 Lagoon is famous for its wild dogs and excellent buffalo and lion interaction. Lagoon like Lebala – except for it markedly different vegetation, has a reputation for predator action. 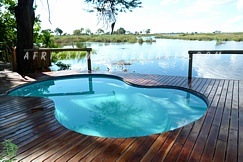 Lagoon is situated in the north of the Kwando concession by the banks of the Kwando River overlooking the Mudumu National Park in the Namibian Caprivi Strip. 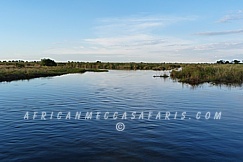 The southerly flowing Kwando river disappears into the vast marshland before emerging as the Linyanti river. 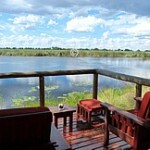 The triangle formed by this vast wetland is home to the Mamili National Park in Namibia. 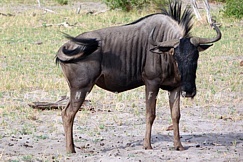 The Kwando River concession is 232000 ha (573000 acres) of unfenced wilderness area and features two camps on the Kwando River – Lagoon and Lebala. 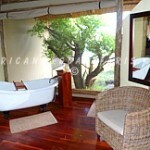 The concession has 80km (50 miles) of exclusive river frontage. 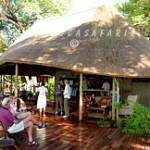 Famous for huge herds of elephant and buffalo with our wild dog viewing considered the best in Africa. 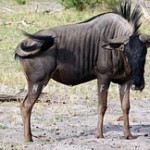 Predators include lion, leopard, hyena, cheetah and four species of smaller cats. 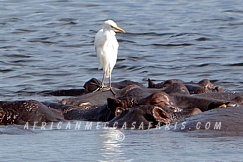 Lagoon has a well-earned reputation for big game and large herds of elephant and buffalo, especially in the winter months, when herds of up to a thousand are not uncommon. 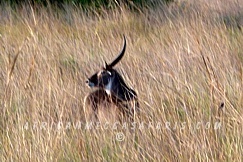 This vast concentration of game attracts the attention of large predators. The Lagoon wild dog pack regularly den close to the camp and the excellent viewing opportunities have led to Lagoon’s reputation as the place to see wild dog in Botswana. Another special activity is the evening river cruise. 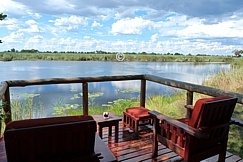 The unique double deck boat allows several guests the opportunity to drift along the river while enjoying spectacular views, mammal and bird life while sipping at your ‘sundowner’ of choice. For those guests who enjoy fishing, there is ample room to throw a line in the water while the boat meanders along. 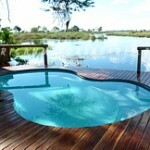 Lagoon offers 4 activities one experience in its exclusive Kwando concession i.e. 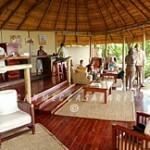 d day and night drives, nature walks, fishing and evening river boat cruises. 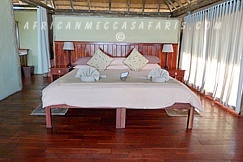 Safaris game drives – Day & Night – Game drives at Lagoon are undertaken in custom designed game viewing vehicles seating no more than six guests at a time in two rows of three. The use of only two rows ensures that guests are never so far from the front of the vehicle that they are unable to hear the guide or tracker’s interpretation, even while driving. 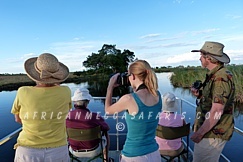 Guests are guided by a two person team of professional guide and tracker – a special feature of the Kwando Safaris wildlife experience. The two person team enables the guide to communicate points of interest and the complex interrelations that exist throughout the natural world, while the tracker ensures no sightings or tracks are missed. 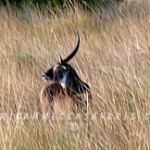 The evening/ night drives are a Kwando Safaris specialty. The drive starts in the late afternoon as the sun’s rays are dipping to the west and the day’s heat is declining. After a leisurely pause for the traditional sundowner, and as the African day is transformed into a soft colorful evening canvas, the night drive begins. The mystery unfolds as the creatures of the night, especially the predators, are revealed by spotlight, often unexpectedly. Fishing trips – Fishing is available at Lagoon. Species that are targeted by sports fisherman are several tilapia (bream) species (including the olive bream or nembwe, red breasted tilapia, purple faced largemouth and three spot tilapia), sharp tooth catfish, African pike and the mighty Tiger fish. 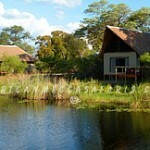 The Okavango is recognized as an excellent fishing destination for both fly fishing and traditional spin fishing. 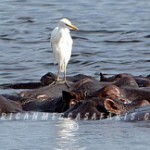 However, not many people are aware of the amazing fishing that can also be experienced on the Kwando River. Due to government regulations, fishing is not possible during the months of January and February as this is a closed season.